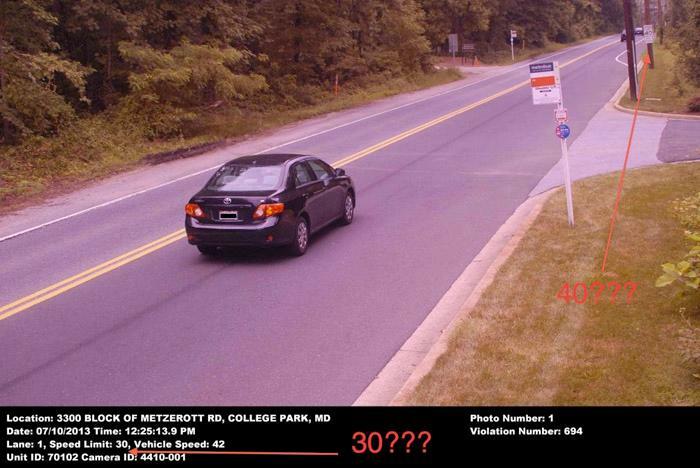 A motorist is questioning the placement of a speed camera on Metzerott Road in College Park, according to a story on WTOP. The camera is enforcing a 30mph speed limit in both directions. However in the westbound direction, the camera is located so close to the end of the 30mph zone that a 40mph sign is actually shown in the citation images. WTOP reported that two Prince George's county police officers said such a camera would not have been placed in such a location , however the officers requested anonymity. "It's very important to have your speed camera locations to be perceived as being fair. Having a camera within view of a sign where the speed limited increases may be technically legal, but it is not perceived as being fair. I can understand why some drivers would be upset," says one officer. "I would agree that this camera being less than 150 feet from the 40 mph speed limit sign is unfair and probably not good practice," says the other officer. 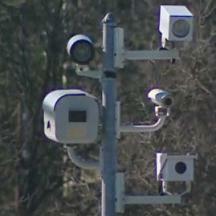 College Park officials told Fox 5 news that they 'have gotten very few complaints about the speed camera". But in fact this very location came under substantial public fire in 2011 for much the same reason. These complaints had been reported in 2011 in the Washington Post, on WJLA, and in The Sentinel. The Diamondback reported in 2010 how motorists were complaining about being 'caught by surprise' at this location, that one councilwoman had received "several complaints from her constituents", and that 8,000 motorists were ticketed in the first 22 days this camera had been in operation. But College Park itself has "gotten very few complaints". Right. I suppose the fact that there's no official place to register a complaint and ensure it will be "put on record" makes it easy to make such a claim. However several drivers had complained to our website about this specific location in 2010 and 2011. When we obtained the city's permit request for this location, we discovered that the current speed limit boundaries were different than those shown on the permit application, which was also supported by a traffic survey provided by the city. College Park says that no speed limits were changed at this location. The WTOP TicketBuster story includes a video showing how short the distance between the camera and sign really is.